You’re taking a getaway because you need to get away! 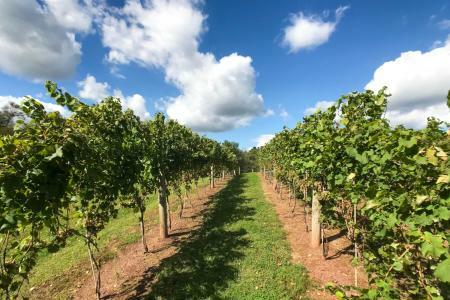 Spend a few hours on the peaceful property of Armstrong Valley Winery & Vineyard in Halifax, where their wine experts welcome you to cloud wine! While some of our region’s vineyards like to throw big parties, Armstrong Valley’s appeal lies in its quaint and quiet country settings. Co-owner Dean Miller has lived in major metros like New York City and Chicago, and he believes that out-of-town visitors come to appreciate Armstrong’s serene surroundings for a space to kick back and relax. Armstrong Valley Winery and Vineyard occupies 100 acres of historic farmland in Halifax, just a 25-minute ride over Peters Mountain. Take your glass of wine on a walking tour of the vineyards, gardens, and grounds featuring several original and renovated structures including an ice house, summer kitchen, spring house, and stable with two resident horses – Cinnamon and Nutmeg – and several roaming barn cats. After you’ve explored a bit, spend a little time in the Courtyard with a bottle of wine and a few good friends. On the weekends, Armstrong hosts live acoustic music to create ambiance while allowing guests to engage in conversation. One word you don’t typically associate with winemaking is farming. In essence, a vineyard is a farm and grapes are the crop. The winemakers at Armstrong Valley encourage their visitors to make that connection between what they’re tasting and where it was made. During their spring, summer, and fall festivals, Armstrong Valley offers tractor rides in the vineyard and behind-the-scenes tours of their wine cellar and processing plant to show guests the winemaking process, from grape to glass. As much as three pounds of fruit goes into making a bottle of Armstrong Valley’s fruit wine. This line of sweet delights includes strawberry, blackberry, orange, cranberry, apple, peach, and raspberry, and their Afternoon Delight is a chocolate-covered strawberry in a glass! Sweet wine lovers should try award-winning Polecat, a blend of Chambourcin & Niagara grapes, that’s named after the barn cats who like to hang out atop the poles in the vineyard. Instead of grabbing a cup of tea on a chilly day, warm up a mug of their Spicy Apple wine that’ll remind you of warm apple pie. Did you know? Red wines can take two years to produce, from grape harvest to bottling, while white wines take 12-16 months. When it comes to good wine, you might think of California or France first. But Pennsylvania winemakers are producing a bounty of flavorful and robust wines at picturesque properties where you’re invited to drink a glass next to the grapevines. 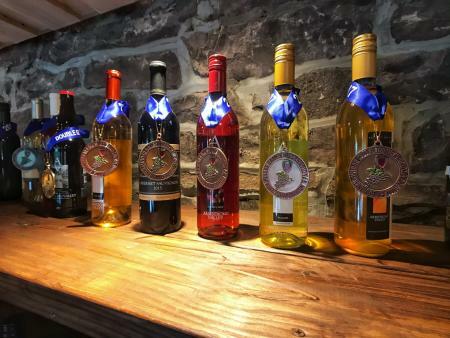 As a testament to their palate-pleasing Pennsylvania grapes, Armstrong Valley has brought an armload of awards home to Halifax. 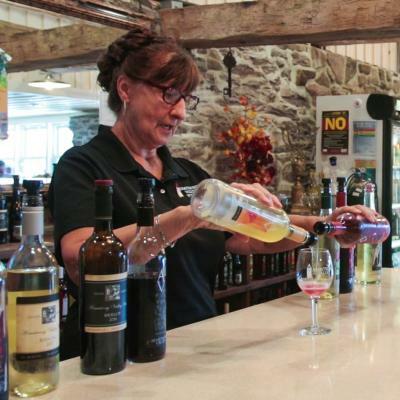 Their Blackberry wine took double gold at the 2016 Finger Lakes International Wine Competition and Cha-Cha, their bubbly variety made with Chardonnay grapes, won three awards at the PA Farm Show, PA Winery Association Wine Competition, and in the Finger Lakes. I’m Ready to Taste! Where To Begin? Wine tastings are not as intimidating or snobby as you might think. Meaning, you don’t need to be a wine connoisseur to know what YOU like! Start with a semi-sweet or semi-dry and share what you love about it with the tasting expert behind the counter. He or she can better pair you with a glass of wine that suits your palate. At Armstrong Valley, you can sip up to 5 wines for free, or upgrade to 10 samples for $5 and you get to keep the glass. Armstrong Valley Winery is known for their delightfully delicious wine cocktails: two or more wines in one glass to create unique blends. Let&apos;s say you taste a wine that is too sweet or too dry for you; they can pour another sample into the glass to unlock new flavors or balance out the taste. For example, combining the sweet berry and chocolate Midnight Desire with Riesling quells the sweetness but maintains the robust flavor. Spicy Apple wine and Riesling together is like fall in a glass, perfect for sitting around the fire. The Orange wine plus Cranberry wine is a Sunrise. Visitors love these inventive combinations so much that Armstrong Valley began bottling popular blends like the Fuzzy Navel (orange and peach wines). Two is better than one, especially when it comes to wine! Fall is a busy time of year for winemakers due to the harvest, but also a beautiful season to visit a vineyard. The heat of the summer is over, the leaves are erupting into a masterpiece of colors, and it’s about time for you to begin squirreling away wine for winter!